MISSION, KS--(Marketwired - Jun 13, 2013) - (Family Features) The summer months are all about color. From flowers in bloom to vibrant beach towels and colorful dresses, summer brings with it a multitude of hues. After picking a color palette, don't go out and paint your whole house with it, start small. Just changing your accent pillows, throws, lampshades or accessories can make a big impact when you are introducing a new color. Remember to make sure the color flows well throughout the entire space, especially if your home has an open floor plan with rooms easily visible from one to another. If you're ready to go all out with color, it's fine to make a dramatic change. 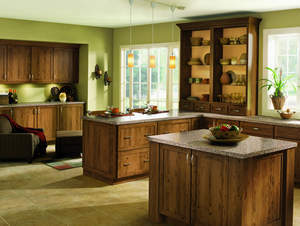 The kitchen is a great place to go big with color and it's usually the gathering place in the home. To bring bold color in the kitchen, and to set the tone for your entire home, update your cabinetry. "Colorful cabinetry can be a big commitment, but it also can set your kitchen apart in a sea of design sameness," said Sarah Reep, director of designer relations and education at KraftMaid Cabinetry. In addition to traditional wood-toned cabinetry styles, there is also a growing selection of on-trend paint and stain colors such as the new Pebble Grey paint from KraftMaid Cabinetry. Take it a step further by choosing glass doors and using a contrasting color on the inside like a sunny, warm yellow or bold teal green for the interior back panel. Cabinetry colors can add whimsy and personality to any kitchen.